The Grid vision has been described as a world in which computational power (resources, services, data) is as readily available as different utilities. They are available to users by means of computational, data, application, information and knowledge services at different levels and areas. These services can interact to perform specified tasks in an efficient and secure way. Their main applications include large-scale computational and data intensive problems in science and engineering. Therefore, Grids are likely to have a deep impact on health related applications. Moreover, they seem to be suitable for tissue-based diagnosis. This chapter analyzes the general structures and functions of a Grid environment implemented for tissue-based diagnosis on digital images. Moreover, it describes the web-based automated image analysis system developed by the authors for diagnostic pathology. Grid technology has enabled the clustering and access to and interaction among a wide variety of geographically distributed resources such as: supercomputers, storage systems, data sources, instruments and special devices and services (Roure, 2005), that is network-centric operations (Alberts, 1999), (von Lubitz, 2006). Therefore Grid infrastructures and services have presented significant challenges at different levels, including: a) Models, from conceptual to implementation, b) Application: formulation and development, c) Programming systems, d) Infrastructures and services, e) Resources management, f) Networking and g) Security (Parashar, 2005). On the other hand, institutions involved in tissue-based diagnosis, including conventional, prospective, indicative and risk-assigned diagnosis, should have access to a variety of sources for data, information, and knowledge, to enable working in an efficient manner (Görtler, 2006). That is why Grids are a promising technology for Diagnostic Pathology. Particularly, medical image processing and the introduction of virtual slides will promote Grid applications in tissue-based diagnosis to fulfil the requirements of Anatomic Pathology applications. Grid computing has been applied in several large-scale projects in biomedicine, such as: BIRN, MammoGrid, Health-e-Child, eDiamond, MEDIGRID, caBIG™ and EAMUS™. The Biomedical Informatics Research Network (BIRN) (Peltier, 2003) initiative focuses on support for collaborative access to and analysis of datasets generated by neuroimaging studies. Both MammoGrid (Amendolia, 2004) and eDiamond (Solomonides, 2003) projects are funded by the European Union (EU) to apply Grid user level middleware and network resources to build and research on a distributed database of mammograms. These projects develop and promote standardization in medical image databases for mammography and other cancer diseases. 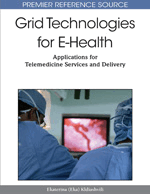 MEDIGRID (Tweed, 2003) is another multi-institutional project investigating the application of Grid technologies for manipulating large medical image databases. The European project Health-e-Child (2006-2009) aims at developing a biomedical information platform, including image analysis and computational models, to share paediatric knowledge and clinical data based on grid technologies (Health-e-Child, 2008).